The LoXX ONE is an automatic doorlock system which gives you the abillity to lock your door with an remote control. So why do I need to use a Loxx? Well in general I don’t need it at all but it’s just fun to play with and part of my domotica project. You can open the door With one push on the remote control. There is an option to always use the nightlock mode so your door is always locked. Anybody can operate a LoXX. The LoXX can communicate with e.g. 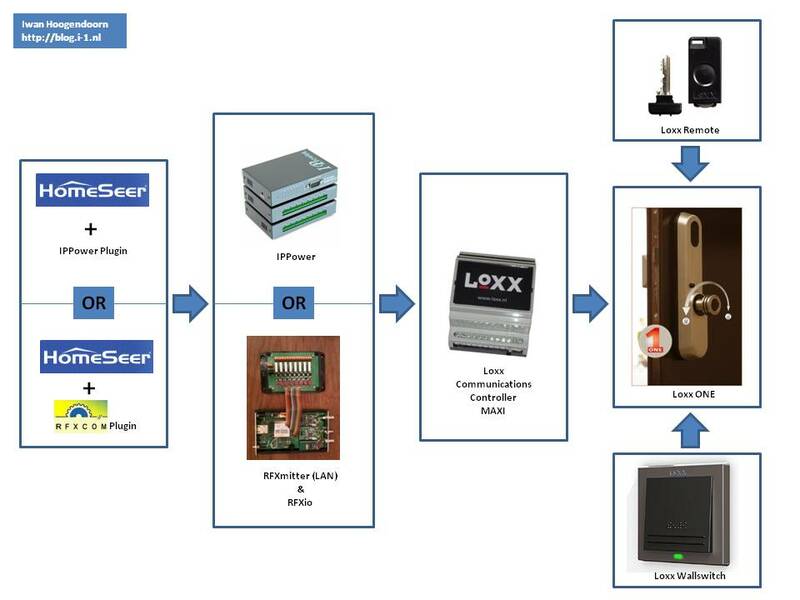 the mobile telephone, alarm system, door automatic and a bunch of other stuff which includes Homeseer2. I ordered the LoXX at a LoXX reseller TANE. This is the LoXX ONE itself … so the electronic mechanism with the SKG** lockcylinder and the parts you need to install it. The 30/45 model is the model I needed because of the thickness of my door. When I people with a door that is less thicker will need the 30/30 model. This is the so called “domotica-controller” which you can use make your Loxx work with other devices. I am personally going to use this controller to integrate my Loxx with Homeseer 2. This controlled was developed together with TANE. The LoXX ONE meets the demands that are set by SKG and PKVW. The remote control (as well as the wall switch and MAXI controller) works with a so-called ‘encrypted Code’ on 868 MHz. Copying is therefore useless, each opening code is unique. The LoXX will change it’s encrypted Code everytime it’s used to something unique. The encryption code has more that 19 trillion possibilities. When the LoXX receives a wrong code for 10 times it will not respond for 5 minutes, when it receives 10 x a wrong code again it will not respond for 10 minutes this will double everytime someone is trying to hack the code. Below you can find a picture how this is going to work in the total setup… I am not sure if I am going to use IP Power or the RFXio to make the connection towards Homeseer 2 so that’s why both solutions are presented. I decided to go for the RFXio option to control the MAXI Controller (and the MAXI controller controles the LoXX One on it’s turn. The RFXio that I use has 8 input or outputs … its just a matter how you would like to use them. I am using at least 2 ports as an output port for now.